The Hummingbird Nano Air Vehicle (NAV) is developed by AeroVironment. A close view of the Hummingbird Nano Air Vehicle (NAV). The Hummingbird NAV can perform a 360 degree loop. 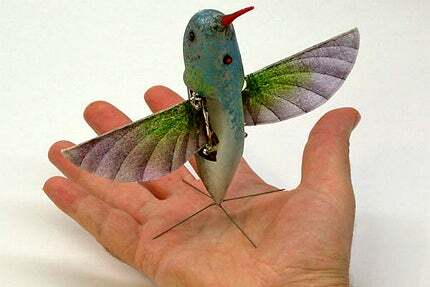 Hummingbird Nano Air Vehicle (NAV) is a remotely controlled ultra light aircraft developed by AeroVironment. The Hummingbird NAV is developed under the Nano Air Vehicle (NAV) development programme sponsored by Defense Advanced Research Projects Agency (DARPA). The NAV project is intended to develop advanced air vehicles to meet the critical operational requirements of US warfighters and other armed forces. The proposed Hummingbird NAV is intended for both indoor and outdoor missions. Hummingbird NAV was recognised by TIME Magazine as one of the 50 Best Inventions of 2011. "Hummingbird NAV was recognised by TIME Magazine as one of the 50 Best Inventions of 2011." The NAV development programme is planned in two phases. The $1.7m first phase of the project includes initial study and design of a new NAV. The second phase contract of the project was awarded to AeroVironment in May 2008. It includes design and testing of the prototype NAV. DAPRA awarded a second phase extension contract to AeroVironment in June 2009. The development of major components, including propulsion system and controls, was covered during the first phase of the contract. The phase two contract includes the demonstration of three-inch flapping-wing NAV. The vehicle’s performance is also optimised during this phase for achieving longer flight endurance. Phase two development programme aims at reducing the weight of the NAV. The Hummingbird was initially tested in December 2008 under phase one of development. The final concept demonstrator was unveiled in February 2011. The NAV achieved the desired hovering with preciseness and also completed forward flight during the demonstration. The Hummingbird NAV is designed based on the features of hummingbird. The aircraft resembles the flying characteristics of a hummingbird. The NAV has a length of about 15cm and weight of just 19 grams. It has a wing span of 16cm. "The Hummingbird NAV can fly in environments inaccessible by human beings and other equipment." The Hummingbird is equipped to carry its own energy source with it while flying. The wings attached to the NAV will help to rotate and turn towards any angle and position as directed by the controlling crew. The NAV carries all the equipment required to fly. The installed equipment includes motors, batteries, control, communication system and a video camera for surveillance and inspection purposes. A tiny on-board camera fitted to the NAV helps for surveillance. The NAV is designed to withstand 2.5 metre per second wind gusts. The Hummingbird NAV can fly in environments inaccessible by human beings and other equipment. The NAV can fly into desired location at a speed of 18km/h. It can fly frontwards with a maximum speed of 10m/sec. The vehicle is mainly intended for urban missions, where use of huge equipment is not possible. The NAV is capable to climb and descend vertically. It can fly sideways to both left and right. It has a demonstrated ability of forward and backward movement. It can rotate clockwise and counter-clockwise. The vehicle can be controlled remotely from a distance of up to one kilometre. It can be operated inside buildings, where unwanted threat is hidden. The Hummingbird NAV flies with the help of two fluttering wings attached to it. It is capable of flying in any direction. The flapping wings allow the NAV to control its attitude during flight. The RQ-11B Raven (Raven B) is a lightweight and low-altitude remote-controlled unmanned air vehicle (UAV) system designed and developed by AeroVironment, US. In December 2006, the UK MoD announced that the contract for the Taranis unmanned air vehicle demonstrator programme had been awarded to a team led by BAE Systems.